It’s been said that this amazing country is more akin to another planet than another continent. You’ll have the distinct feeling that you’ve traveled out of this world to an incomparable land beyond the borders of all that’s predictable or ordinary. Explore the lush parkland and rich history of Adelaide, award-winning wineries in nearby Barossa Valley, and indigenous wildlife on pristine Kangaroo Island. In Melbourne and Sydney, your days are filled with sophisticated city sights from chic shops to cathedrals, museums and galleries to breathaking nature at the city’s edge. At Uluru, explore the world’s largest monolith and embark on a spellbinding guided tour of the star-filled nighttime sky. And snorkel and swim in the beautiful waters of the Great Barrier Reef, a UNESCO World Heritage Site. You are met upon arrival and escorted to your luxury hotel. Though it began as a penal colony in 1788, today Sydney is a charming cosmopolitan city. It is the capital of the state of New South Wales, and the largest and most extravagant Australian city with a population of four million people, busy streets, and imposing skyscrapers. In the late morning, enjoy a private tour of Sydney’s highlights. See the colorful Botanical Gardens, Hyde Park and Mrs. Macquarie’s Chair, which was carved out of a rock ledge for then Governor Lachlan Macquarie’s wife. It offers spectacular views of the Opera House and Sydney Harbour Bridge. Continue through lively Kings Cross, Paddington, and Watson’s Bay en route to famous Bondi Beach. Enjoy a delightful lunch. Next, explore the historic Rocks District. On Day 2, take a private tour inside the iconic Sydney Opera House, visit the Sydney Museum, and enjoy a lunch cruise of beautiful Sydney Harbour. Enjoy a full-day private tour to the beautiful Blue Mountains National Park on Day 3. Fly to Uluru in the center of Australia’s red desert, and spend the day in the shadow of this monolith, a spiritual monument of the Aṉaŋu (Aboriginal people). Enjoy the sunset at Uluru with an unforgettable dining experience under the stars, and discover the wonders of the southern night sky. At your hotel, the interior décor features Aboriginal heritage and culture, an art gallery lcoated in the lobby, and significant artworks featured throughout the hotel. Arise early this morning to witness the dramatic sunrise over Uluru. A short walk with your expert guide brings you close to this wonderful and powerful place, viewing rock art, exploring waterholes and appreciating the unique flora and fauna of the area. 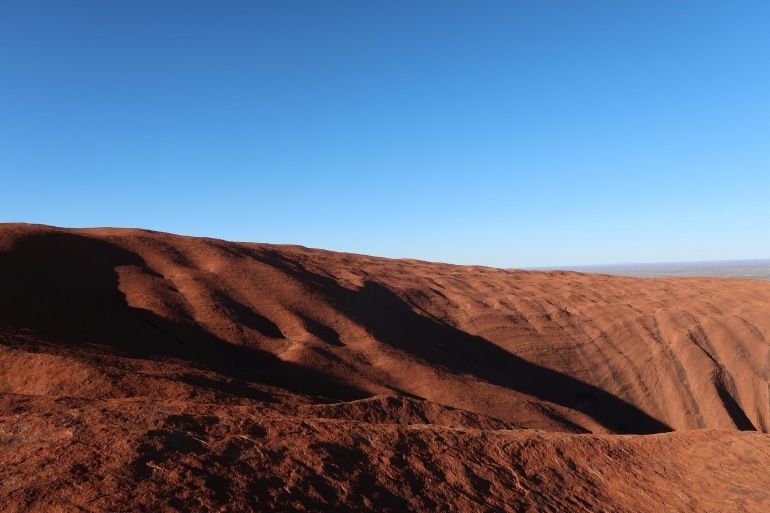 Learn about the history and myths of this spiritual monolith, and visit the Uluru and Kata Tjuta Cultural Centre to discover more about the region. Afterwards, fly south to Adelaide. On Day 6, you’ll enjoy a private day tour of Australia’s famed Barossa Valley with a wine specialist as your guide. Start with a drive through the scenic Torrens Gorge, out to the Adelaide Hills and into Barossa Valley wine country. Explore a variety of wineries as you uncover the history of the area. The valley was settled in 1840’s by both German immigrants and English settlers, who brought with them a culture of growing, cooking, and preserving food. Your guide will assist in creating a personalized itinerary of stops suited to your taste. Enjoy a delicious lunch, and then take the picturesque drive up to Menglers Hill for unsurpassed views over the entire valley. Drive into historic Angaston, the more English of the villages in the Barossa Valley, and enjoy afternoon tea at Maggie Beers Farm Shop. On Day 7, fly to unspoiled Kangaroo Island, renowned for its rugged coastline, white sand beaches, and indigenous wildlife, including kangaroos, koalas, fur seals, and more. With a rich heritage and a world-class food and wine culture, Australia’s third largest island offers endless opportunities for exploration and adventure. Enjoy a guided 4X4 tour of the island that includes a range of wildlife experiences and a picnic lunch. Fly to Melbourne, Australia’s cosmopolitan, riverside capital city on Day 8. Here you’ll enjoy a private afternoon tour along “The Golden Mile,” explore Melbourne’s precincts, visit the Queen Victoria Market, and stop for lunch in Federation Square. On Day 9, enjoy the morning at leisure followed by an afternoon visit to the Koala Conservation Centre. Next, travel to Phillip Island, where at sunset you’ll watch the parade of the Fairy Penguins as they waddle ashore to their sand dune burrows — one of the world’s great wildlife wonders. Fly to Cairns on Day 10, where you will be met and escorted to your hotel in Port Douglas with the remainder of the afternoon at leisure. This evening, enjoy a special dinner. Relax in the warm glow of hospitality, fabulous food and Australian wines. On Day 11, enjoy a glorious day on the water as you cruise to the outer coral gardens of the Great Barrier Reef, the world’s largest coral reef system. Enjoy several hours of snorkeling and a freshly cooked lunch. Day 12 is at leisure for you to relax on the beach or take optional tours to the Daintree Rainforest or the Kuranda Skyrail. On Day 13 you will be transferred to the airport for your flight home or on to your next destination. The Langham, Sydney blends the modern charm and attention to detail of a boutique hotel, with the timeless elegance and refined sophistication that are hallmarks of the Langham heritage. Ideally positioned in the heart of Sydney's historic Rocks district, The Langham, Sydney is within easy walking distance of luxury boutiques, tourist sites, award-winning restaurants, museums and galleries. Delightfully intimate, The Langham, Sydney comprises 96 luxurious guest rooms and suites. Designed for the most discerning traveller, guests can indulge in the comforts of the Grand Langham Rooms, the exceptional space of the Junior Suites, the privacy of the Langham Suites or the exclusive luxury of the Observatory Suite. Named after the soaring white sails that crown its roof, this is Voyages Ayers Rock Resort's premium hotel. The interior decor focuses on Aboriginal heritage and culture, with a gallery in the lobby and significant artworks featured throughout the public areas and in the private rooms. The Hotel also features the acclaimed Mulgara Gallery, the lively, buffet-style Winkiku Restaurant, tapas-style cuisine by the pool at Rockpool (seasonal), and the award winning signature restaurant of Voyages Ayers Rock Resort, Kuniya Restaurant. Relax in beautifully appointed rooms, enjoy a cocktail in the lovely grounds, or sit back and relax under the magnificent white sails. Style, elegance and a touch of glamour comes to Adelaide with the arrival of the city's newest five star boutique hotel. The magnificent Mayfair Hotel is located right in the heart of the city at the corner of King William and Hindley Streets in the heritage-listed, beautifully renovated Colonial Mutual Life building. Complemented by a stunning 'jewel box' addition beautifully complementing the 'Romanesque' style building, the Mayfair Hotel is the gateway linking the recently refurbished Rundle Mall and Adelaide's exciting new Riverbank Entertainment Precinct. Offering luxury accommodation, contemporary dining and premium hotel facilities, the Mayfair Hotel also showcases the very best of South Australia, including innovative food and wine and quality locally made products and furnishings. Mayfair Hotel’s 170 elegant and well-appointed rooms and suites are complemented by stylish spaces including light filled meeting and function rooms, business centre, gym. Welcome to what is surely Adelaide's most iconic hotel - the beautiful Mayfair Hotel. The luxurious Langham Hotel has a commanding position along the renowned Southbank Promenade overlooking the tranquil Yarra River. It is surrounded by al fresco cafés, restaurants and boutiques, and close to the National Gallery of Victoria, Federation Square, the Arts Centre and Crown Casino. Hotel features and services include a health club, fitness facilities, full-service spa, sauna, indoor swimming pool, beauty salon, boutique, laundry services and a business center. There is also a fine dining restaurant, coffee shop, bar and lounge. All 387 rooms have classic-style wood furnishings, floral-patterned thick drapes, and Australian artwork. Room amenities include cable TV, high speed Internet access, a minibar, coffee/tea maker, and an in-room safe. The large marble bathrooms have crystal-prism light fixtures, two large mirrors, bathtubs, and separate, glass-enclosed showers, as well as bathrobes and slippers. Separate from the bathroom are handy, marble-topped vanity areas with mirrors. Luxury Port Douglas accommodation awaits you at Thala Beach Nature Reserve. Thala Beach Nature Reserve is the only five-star luxury hotel located on a private headland between Cairns and Port Douglas. The resort offers eco-friendly accommodation options that are sensitively positioned amongst the resort's 145 acre property. Unique on-site experiences are included in the room rate to make your stay with us extra memorable. Rainforest backs onto Thala's private beach frontage providing a natural setting for guests to relax in nature while still being within easy access of The Great Barrier Reef, Cairns, Port Douglas and the Daintree Rainforest.